"Meet Annie and Keith. They've been battling it out their whole lives - too bad mom forgot to keep score. They still love each other though, in a hate-hate sort of way. Black eyes, bruises, bite marks and unexpected haircuts are just a few ways of saying "I love you" to your sibling. Good thing they are related or it might be considered assault!" Finally! 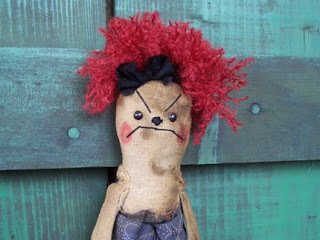 Dolls that speak to my inner misanthrope! 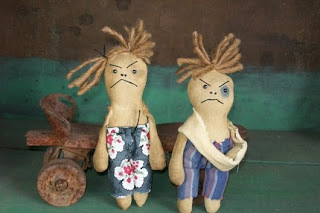 I've admired the twisted little dolls from Gravel Alley Primitives for quite some time. Reading their stories makes me laugh and reminds me not to take life so seriously - after all, no one gets out alive. I've leave you with another story for the road. "She looks forward to the day when she can call you "hun" and make you wait 13 minutes while she changes her cash register tape. She'll giggle and say, "I'm new," even though she's not. She'll forget to scan your coupons and then make you stand in line at the customer service counter to get your discounts. She's mean like that. " Strawberries take a little patience.